What last year was Mazda Motor Corp.'s biggest headache has become a key earnings advantage: its heavy exposure to the Japanese yen. Mazda builds about three-quarters of its vehicles in Japan, making it far more dependent on exports than Toyota, Honda and Nissan. As a result, an unfavorable yen rate was a major drag on Mazda's earnings for much of the past three years. But this year, the yen has weakened considerably. A year ago, it took ¥80 to buy one dollar. Today, you need about ¥100 to buy a greenback. For exports from Japan, that's good. It means, in simple terms, that if Mazda takes in $20,000 on the U.S. sale of a car, that becomes ¥2 million now, vs. ¥1.6 million in 2012. The swing has turbocharged Mazda's earnings. 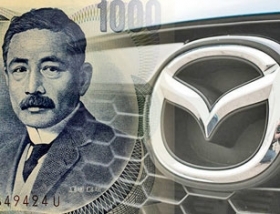 In the quarter that ended June 30, foreign-currency gains contributed ¥29.2 billion ($296.2 million) to Mazda's operating profit of $370.4 million. The forex gains pushed Mazda into the black, with net income of $55.4 million, vs. a year-earlier loss of $65.5 million. The forex swing also helped Mazda to post a profit in its fiscal year that ended March 31, reversing four years of annual losses. Other Japanese automotive companies also are benefiting from the yen's rate. But Mazda, being more exposed to the yen, is benefiting more. Still, give Mazda credit. It is in a strong position to capitalize on the weaker yen because of actions taken over the past few years to shield itself from the yen's former profit-killing strength. For example, the suite of technologies it collectively brands as Skyactiv were designed to make more-efficient vehicles and to help the company build its vehicles more efficiently. The weaker yen won't last forever. But for now, at least, it must be nice for Mazda, as a small, independent automaker, to have a currency tailwind.